For the genus of moths, see Lophophora (moth). Lophophora is a genus of spineless, button-like cacti native to Texas from Presidio county (Big Bend National Park) south right along the Rio Grande river to Starr County, Texas. Its range continues south through Northeast and north central Mexico to Querétaro in central Mexico. The species are extremely slow growing, sometimes taking up to thirty years to reach flowering age (at the size of about a golf ball, excluding the root) in the wild. Cultivated specimens grow considerably faster, usually taking between three and ten years to reach from seedling to mature flowering adult. The slow rate of reproduction and over-harvesting by collectors render the species under threat in the wild. Lophophora means "crest-bearing", referring to the tufts of trichomes that adorn each tubercle. The name is derived from the two Ancient Greek words λοφος (lophos, the crest of a hill or helmet) and φορεω (phoreo, to carry). Lophophora has been reported to have two species, L. diffusa and L. williamsii. Another three species have been proposed[by whom? ]: L. fricii, L. koehresii, and L. alberto-vojtechii. Recent DNA sequencing studies (Butterworth et al. 2002) have shown that L. diffusa and L. williamsii indeed are distinct species. DNA evidence from the alleged species L. fricii and L. koehresii would allow for more accurate classification. Lophophora diffusa (Croizat) Bravo : The plants are yellow-green, usually lacking well-defined ribs and furrows. The podaria are rarely elevated, but are broad and flat. The tufts of hair are usually spread unequally on the prominent podaria. The flowers are commonly whitish to yellowish-white. 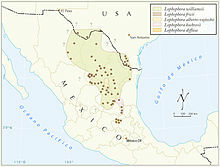 L. diffusa occurs at the south end of the range of the genus in Querétaro state, Mexico. This species contains zero to trace amounts of mescaline; pellotine is the principal alkaloid. Lophophora williamsii (Lemaire ex Salm-Dyck) J.M.Coult. The plants are blue-green, usually with well-defined ribs and furrows. The tufts of hair are usually equally spaced on the ribs. The flowers are pinkish or rarely whitish. L. williamsii occurs in the full range of the genus except in Querétaro state, Mexico. The mescaline content in dried "Peyote" can reach almost 7%. Lophophora species easily adapt to cultivation, requiring warm conditions and a free-draining substrate, and to be kept dry in winter. ^ C. A. Butterworth & J. H. Cota-Sanchez, & R. S. Wallace (2002), ”Molecular systematics of Tribe Cacteae (Cactaceae: Cactoideae): A phylogeny based on rpl16 intron sequence variation”, Systematic Botany 27 (2), 257-270. Wikimedia Commons has media related to Lophophora.